As you are likely aware, there are varying rules when it comes to required minimum distributions (RMDs) from retirement accounts—both IRAs and qualified plans. As you also know, for your clients who have reached the age when they need to start taking retirement income, these rules can be quite confusing. 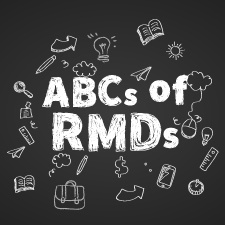 To help you provide some clarity to your RMD conversations, I’ve created this brief primer that answers common questions, highlights frequent scenarios, and points out errors to avoid. Download our free guide for a side-by-side comparison of required minimum distributions by retirement plan type. What Is the Required Beginning Date? Distributions from 401(k) plans and IRAs are required starting the year in which an individual turns 70½, otherwise known as the required beginning date (RBD). In addition, a client must pay income tax on each withdrawal. The first RMD can be deferred until April 1 of the year following the year that your client turns 70½. For all subsequent years, RMDs for the current year are due by December 31 of that year. First-year RMD deferral. Retirees who defer their first RMD will need to take two distributions in the same year: one RMD will be due for the year delayed, and the second will be due for the current year. The December 31 value for the current-year RMD will not be reduced by the amount that the client has deferred. Both RMDs will be taxed as income for the year in which the RMDs are taken. Here, keep in mind that two such withdrawals could significantly increase a client’s income tax bill for that year. Let's look at an example to see how this might work. Jane turned 70½ in 2017. She is required to take an RMD for 2017, based on the December 31, 2016, year-end value of her account. Because 2017 is Jane’s first RMD year, she may defer taking the RMD until April 1, 2018. She must take her 2018 RMD by December 31, 2018, based on the 2017 year-end value of her account. Deferring her RMD for 2017 does not reduce the 2017 year-end value of her account on which her 2018 RMD will be based. Both RMDs must be taken in full in 2018 based on the appropriate year-end values, and both RMDs in this case will be taxable to Jane in 2018. Best practice: Before deferring an RMD, clients should consult with their tax advisor to determine whether two RMDs in the same year will force them into a higher tax bracket. Is There a Penalty for Missing an RMD? Yes, there is a tax penalty for failing to take an RMD or for failing to take a large enough distribution. This penalty is 50 percent of the RMD amount not taken. Your client would also have to pay regular income tax on the amount that should have been withdrawn. Best practice: IRA owners who forget to take their RMDs should take them immediately once they realize their oversight. If the IRA owner believes that the missed RMD was due to a reasonable error, and if he or she has taken or is taking steps to remedy the missed distribution, the owner can request a tax waiver by completing IRS Form 5329 and attaching a statement of explanation. How Do RMDs Work for Roth Accounts? Roth conversions. RMDs are not eligible for conversions to Roth IRAs. If a traditional IRA owner is at least 70½, his or her RMD for that year must be taken prior to a Roth conversion. But because RMDs are not required for Roth IRAs, once the RMD has been taken from a traditional IRA and a Roth conversion is complete, the Roth IRA money will not be subject to RMDs going forward. Keep in mind that completing a Roth conversion is a taxable event, and taxes on Roth IRA contributions have already been paid. As such, that money can be withdrawn as needed tax free. Roth 401(k) and 403(b) plans. RMDs are required for Roth 401(k) and Roth 403(b) plans, even though taxes have already been paid on the deposits. Because the money for these plans is post-tax, however, RMDs will not increase a client’s taxable income (as a traditional IRA RMD would). But if your client misses an RMD, he or she will incur a 50-percent penalty. Another important point to consider is that if a client chooses to roll over 401(k) or 403(b) funds after turning 70½ and an RMD is due, the RMD portion of the account balance is ineligible for the rollover. Therefore, the RMD must be satisfied before rolling over the funds into a Roth IRA. Best practice: Encourage clients to consult with a tax advisor to determine whether it would be beneficial to roll a 401(k) or 403(b) plan into a Roth IRA before the clients’ RBD. Can Qualified Plan RMDs Be Delayed? For those still working after age 70½, distributions from their current 401(k)—but not from their IRA—can be delayed until April 1 of the year after they retire. If your clients do delay, it means that they can leave that money in the plan, thus reducing their drawdown rate until they retire. With SEP and SIMPLE IRA plans, on the other hand, clients can continue to make contributions if they are still working at age 70½, but they must take RMDs. Individuals must begin taking RMDs by April 1 of the year following the year they turn 70½ or the year they retire (if allowed by the plan), whichever is later. If, however, an individual owns 5 percent or more of the business sponsoring the plan, he or she must begin receiving distributions by April 1 of the year after the calendar year in which he or she reaches age 70½. Best practice: Review the terms and conditions that govern your clients’ qualified plans to understand the rules for taking RMDs. The terms that govern one qualified plan may allow clients to wait until the year they actually retire to take their first RMD (unless they are a 5-percent owner), while those of another plan may require clients to begin taking distributions by April 1 of the year after they reach age 70½, even if they have not retired. What Are the Employer Requirements? Employers must continue making plan contributions for employees even if the employees have turned 70½ and are taking RMDs. The employer must also give an employee the option to continue making salary deferrals as long as the employee is eligible to participate in the plan. If the employer does not adhere to this requirement, the plan can lose its qualified status. If a plan does fail to meet this requirement, the situation can be corrected through the Employee Plans Compliance Resolution System, available in the Correcting Plan Errors section of the IRS website. RMDs can be aggregated, but it depends on the type of retirement plan. For IRAs (i.e., SEP, SIMPLE, and traditional), RMDs may be aggregated. The IRA owner must calculate the RMD separately for each IRA owned. If your client has multiple traditional, SEP, or SIMPLE IRAs that require an RMD, he or she may take a distribution from one of them to satisfy the total RMD amount for all of them. For 401(k), profit-sharing, and 457(b) plans, RMDs must be taken separately. If an individual has a 401(k), profit-sharing plan, and traditional IRA, he or she is required to take a separate RMD from each plan. These RMDs may not be aggregated with other RMDs from nonqualified plans or each other. If a client rolls over these plan amounts into an IRA before his or her RBD, the RMD rules for IRAs apply. If the individual rolls over the funds after turning 70½ and an RMD is due, the RMD portion of the account balance is ineligible for the rollover and must be satisfied separately before the funds are rolled over into an IRA. For 403(b) plans, RMDs may be aggregated. Like an IRA owner, a 403(b) plan owner must calculate the RMD separately for each 403(b) plan owned but can take the total amount from one or more of the 403(b) plans to satisfy the entire RMD plan amount. A 403(b) plan owner cannot, however, take an RMD from a 403(b) plan to satisfy one from an IRA or an RMD from an IRA to satisfy one from a 403(b). Additionally, 403(b) plan RMDs cannot be aggregated with 401(k), profit-sharing, or 457(b) plans. I hope you will find this primer useful in your retirement planning discussions. As you can see, the various situations regarding RMDs can be complex and confusing, so guiding your clients through the rules and tax implications is crucial. What other questions are your clients asking about required minimum distributions? What questions do you have? Share your thoughts below! Editor's Note: This post was originally published in December 2014, but we've updated it to bring you more relevant and timely information.